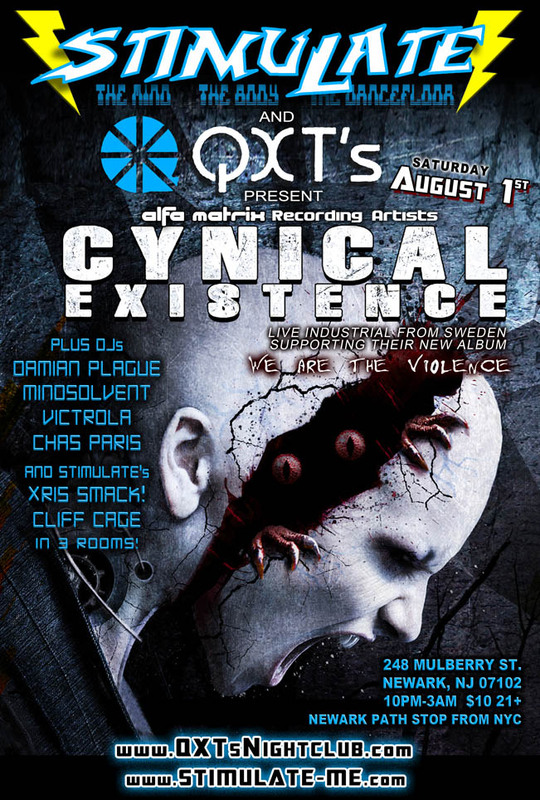 08/01/15 – STIMULATE + QXT\\\’s present CYNICAL EXISTANCE (from Sweden) on their 2015 U.S. Tour! STIMULATE + QXT's present CYNICAL EXISTANCE (from Sweden) on their 2015 U.S. Tour! on their 2015 U.S. Tour! Acknowledging inspiration from bands in the likes of [SITD], SUICIDE COMMANDO, GRENDEL, Swedish act CYNICAL EXISTENCE offers a powerful mixture of old school EBM with a harsher industrial tone. Melodic synth lines collide with stand-out vocal angst while infusing more personal emotions, inviting you to an intriguing introspective journey into Fredrik's dark soul and tortured mind. Industrial / Electro / Synthpop + more! :Chas Paris, Cliff Cage, Cynical Existance, Damian Plague, EBM, Industrial, QXTs, STIMULATE, Victrola, Xris SMack!